Once I know where I am free to carve, and where I need to take it easy, I begin by carving cross-grain with a medium-large gouge. I check periodically with a caliper. 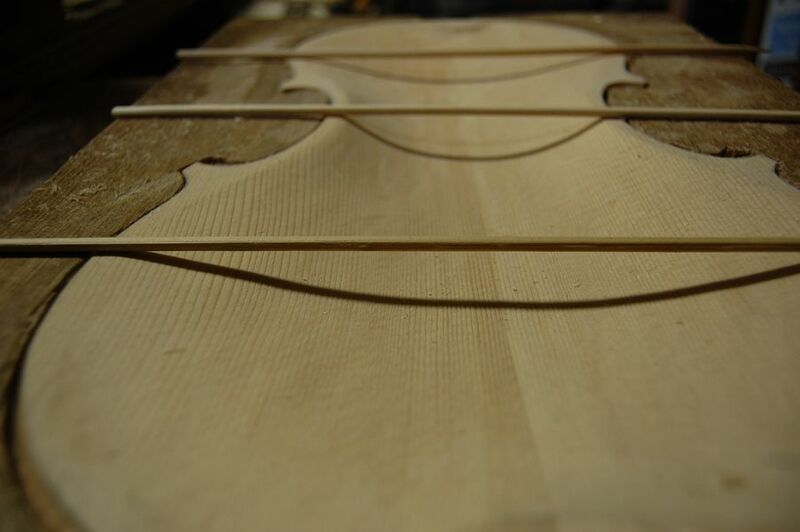 When it begins looking closer to the right shape inside, I measure again, and double check those special spots. Beginning graduation, using a gouge. 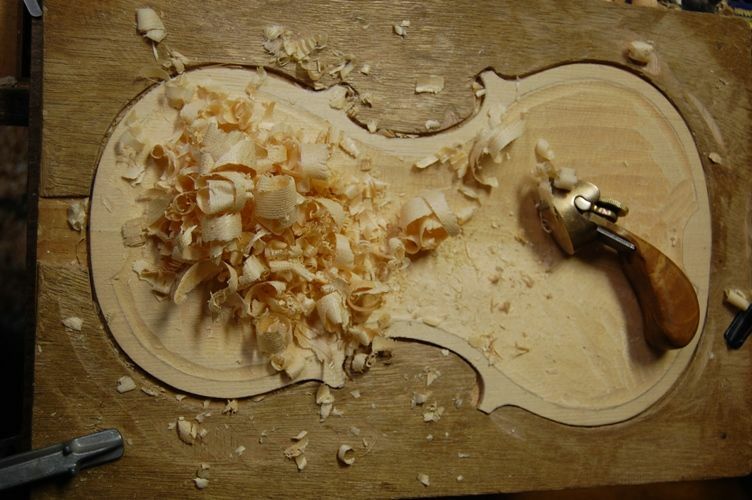 Then I go after it with a toothed finger-plane. This is really just an Ibex 18 mm finger-plane with a toothed blade, and a wooden handle added to save my fingers. I originally added that handle to keep from blistering my forefinger and thumb, as I had done so on every single instrument up to that point. 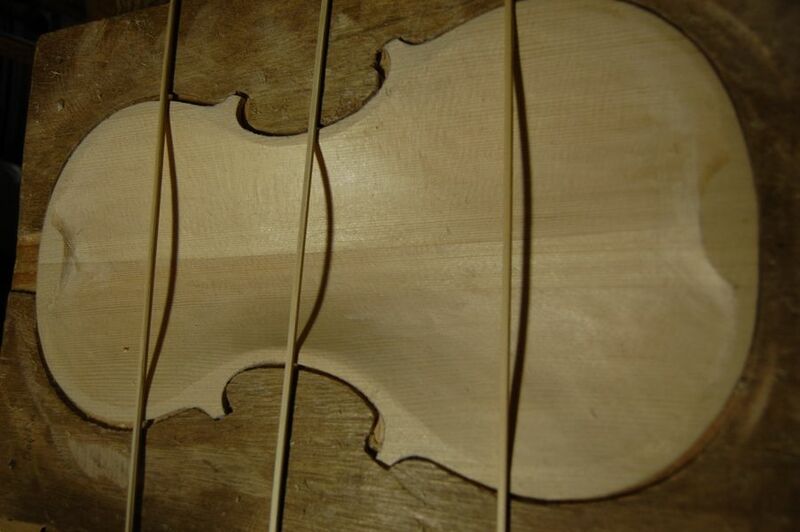 (That was my #16 instrument– a cello.) I was surprised to discover that it also gave me much more power and control so that I was able to set the blade deeper and carve much more aggressively, taking off much thicker shavings. Using a Toothed Finger Plane to further the Graduation process. Graduation nearly completed– the skewers are only there to create shadows so that the contiour will show in the photograph. Another view, at a lower angle. There are still a few lumps to smooth out, but the graduation is essentially complete. Usually, by that point, I am beginning to see the interior of the f-holes, too, because, as you may recall, I had incised them pretty deeply. Once the inside is complete, I finish cutting the f-holes. 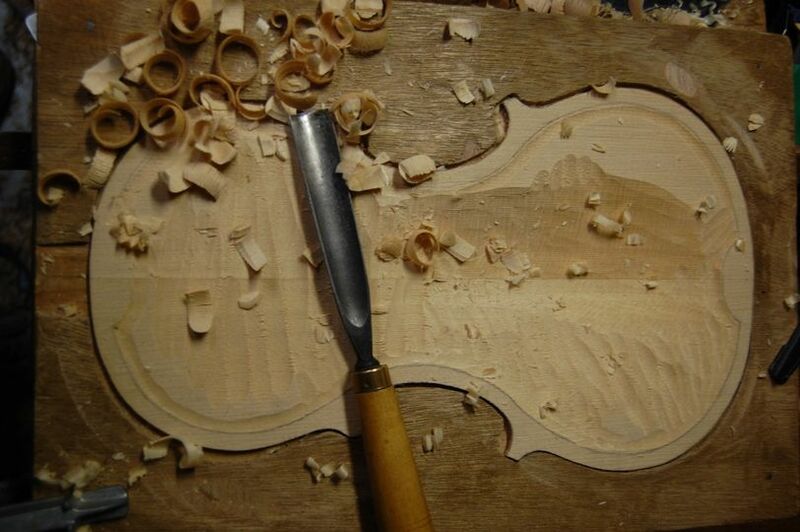 Many people use a jeweler’s saw, a fretsaw, or a coping saw to cut out the f-holes. I generally just use the knife, except that I do have a special tool for cutting the round upper and lower eyes. And that is what I will show in the next post…which, hopefully will be sooner this time.